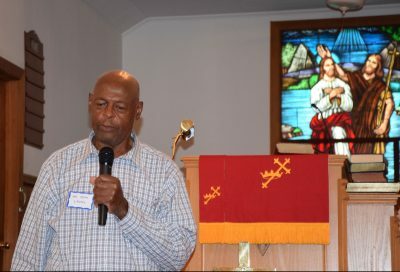 Retiree John Laury has recently been researching cemeteries near his home in Union Hill, a small community in rural Buckingham County, Va., where slaves and their descendants were buried. It’s been difficult — some of the deceased are likely his forebears and most graves are unmarked, long ago forgotten. His project has taken on a new urgency. Several years back, Dominion Energy applied to the Federal Energy Regulatory Commission to build the 600-mile fracked-gas Atlantic Coast Pipeline, running south from West Virginia through Virginia and North Carolina, including a massive compressor station in Union Hill. Both Dominion and FERC, which has approved the project, have essentially ignored the deep history of the community, founded by freedmen and still predominantly African-American. This cultural “erasure,” as anthropologist Lakshmi Fjord describes it, is nothing short of racist. Virginia Delegates Mark Keam (l) and Sam Rasoul, with the James River in the background. The delegates heard from residents of Union Hill and Yogaville in Buckingham County about threats from the Atlantic Coast Pipeline. Photo Cat McCue. 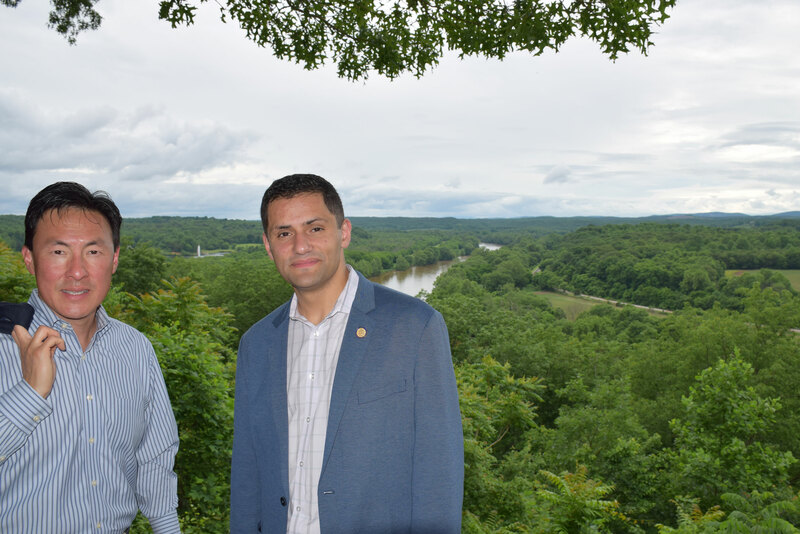 Virginia Delegates Sam Rasoul and Mark Keam, who have staunchly opposed the Atlantic Coast Pipeline, and the similar Mountain Valley Pipeline proposed by EQT, were in attendance at the gathering in Buckingham County and encouraged the citizens to keep fighting. The homes in Union Hill are mostly modest, brick or wood frame houses that in and of themselves hold little historic significance. But they are occupied by descendants of slaves and freedmen, like Laury, who have been living in the community continually for generations. “It’s that continuity of history that’s important,” said Fjord. In 2016, Union Hill received a “Most Endangered Historic Place” listing by Preservation Virginia due to threats posed by the pipeline and compressor station, and the community is now nominated for listing by the Virginia Department of Historic Resources. 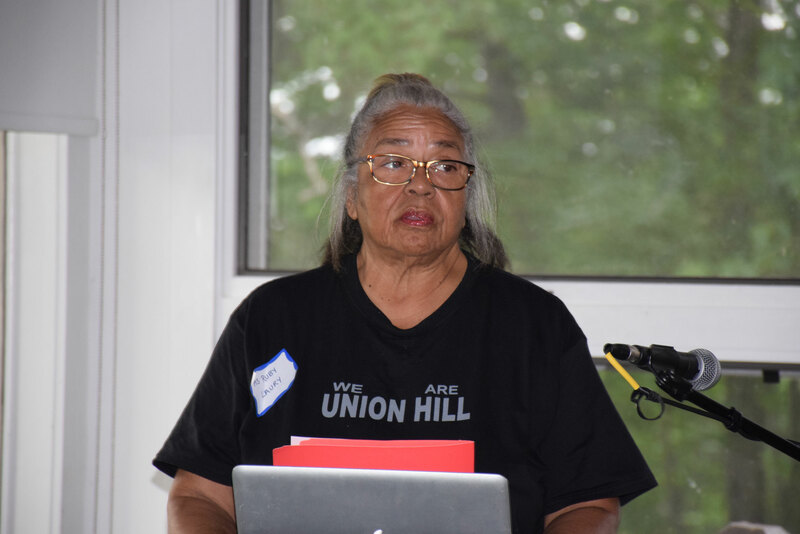 At the advisory council meetings, Fjord and others shared a host of examples of how Union Hill is being overlooked during the regulatory process for the pipeline and compressor station. Neither FERC nor the Virginia Department of Environmental Quality held a public hearing in the county, so very few citizens could afford the time or expense to provide their comments in person. Dominion and FERC underreported the population density of the community, using a countywide average instead. As a result, the pipeline can be built with thinner walls and farther distances between emergency shut-off valves. And despite the fact that FERC’s final environmental report noted that the compressor station would be in a census tract designated as a low-income, environmental justice population, it approved the project anyhow, and Dominion has made no plans to change locations. On May 30, the Governor’s Advisory Council on Environmental Justice adopted a draft statement calling for a moratorium on new gas infrastructure in Virginia and a stream-by-stream analysis of the impacts of the Atlantic Coast and Mountain Valley pipelines. The council expects to finalize its recommendations to Gov. Ralph Northam’s administration soon.